With four cores, eight threads and monumental memory bandwidth, Intel's Core i7 processor is hugely powerful. But it comes at quite a price. In fact, thanks to a complex architecture designed mainly for workstation and server systems, it's arguably overkill for desktop PCs. What we'd really like, therefore, is a rejigged version of Core i7 with all that juicy multi-threaded performance but the superfluous server trimmings discarded. As luck would have it, Intel is launching just such a chip today. That's the good news. The bad news is that we're not quite sure what to call it. Internally at Intel, it's codenamed Lynnfield. Confusingly, however, versions of the new chip will be sold as both Core i5 and Core i7 processors. The defining difference between the two is the presence of HyperThreading. Core i7 chips get it and can therefore simultaneously crunch two software threads per core and eight in total. Core i5 CPUs don't and thus are restricted to four threads. 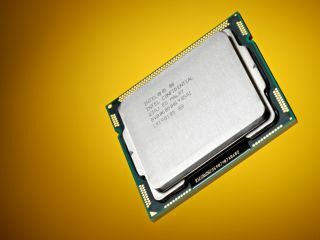 Making matters even more baffling for the average PC-buying punter, this new chip also gets a new 1,156-pin processor socket. The net result of which is that Intel is now selling two entirely different and mutually incompatible Core i7 processors. First, there's the existing Core i7 900 series and its LGA 1,366 socket. Joining it is the new Core i7 800 series along with the Core i5 700 series, both of which require the new LGA 1,156 socket. As a branding exercise, Lynnfield is frankly a bit of a mess. But we might just forgive Intel if the chip delivers on its promise of premium performance at a more palatable price. To find out if Intel has pulled it off, hop on over to our reviews of the Core i5 750 and Core i7 870 chips.